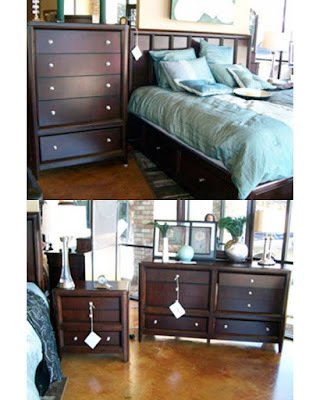 We've been talking for years (literally) about buying new bedroom furniture. The big issue has been whether we needed one dresser, or two. I was in favor of one (only use 3 drawers now) and Beau felt we needed two (he's big drawer man .... that T-Shirt collection). We've been bantering it around for at least 10 years. It came back up recently and for lack of something better to do on Thursday, we visited a couple furniture stores, adding 2 more on Friday. And, arrived at a decision .... tada ... new furniture. Then, the biggest decision ... when to get it delivered. Decide on new wall color .. hopefully something compatable with the color we last painted the ceiling. Change colors of the door. I'm feeling tired already. So, we told them we'd call in 2-3 weeks and discuss delivery ... No since rushing into it.